EDITOR’S NOTE: Research support was provided by the Puffin Foundation Investigative Fund at The Nation Institute. Over the course of the presidential campaign, John McCain has repeatedly emphasized his willingness to stand up to Russian Prime Minister Vladimir Putin as proof that only he possesses the fortitude and judgment to become the next leader of the free world. In his acceptance speech at the Republican convention, McCain lashed out at Putin and the Russian oligarchs, who, “rich with oil wealth and corrupt with power…[are] reassembling the old Russian Empire.” McCain rushed to publicly support the Georgian republic during its recent conflict with Russia and amplified his threat to expel Moscow from the G-8 club of major powers. His running mate, Sarah Palin, suggested in her first major interview that the United States might have to go to war with Russia one day in order to protect Georgia—the kind of apocalyptic scenario the United States avoided during the cold war. Yet despite McCain’s tough talk, behind the scenes his top advisers have cultivated deep ties with Russia’s oligarchy—indeed, they have promoted the Kremlin’s geopolitical and economic interests, as well as some of its most unsavory business figures, through greedy cynicism and geopolitical stupor. The most notable example is the tale of how McCain and his campaign manager, Rick Davis, advanced what became a key victory for the Kremlin: gaining control over the small but strategically important country of Montenegro. At the time, Putin wanted to establish a Russian outpost in the Mediterranean, and Montenegro–a coastal republic across the Adriatic from Italy—was seen as his best hope. McCain also lobbied for Montenegro’s independence from Serbia, calling it “the greatest European democracy project since the end of the cold war.” For McCain, the simplistic notion of “independence” from a country America had gone to war with in the late 1990s was all that mattered. What Montenegro looked like after independence seemed not to interest him. This suited Putin just fine. Russia had generally sided with Serbia against the West during the Balkan wars of the 1990s, but for the Kremlin, cutting Montenegro free from Serbia meant dealing with a Montenegro that could be more easily controlled. Indeed, today, after its “independence,” Montenegro is nicknamed “Moscow by the Mediterranean.” Russian oligarchs control huge chunks of the country’s industry and prized coastline—and Russians exert a powerful influence over the country’s political culture. “Montenegro is almost a new Russian colony, as rubles flow in to buy property and business in the tiny state,” Denis MacShane, Tony Blair’s former Europe minister, wrote in Newsweek in June. The takeover of Montenegro has been a Russian geostrategic victory–quietly accomplished, paradoxically enough, with the help of McCain and his top aides. Russia’s virtual takeover of Montenegro was well under way by January 2006, when Rick Davis introduced Deripaska to McCain at a villa in Davos, Switzerland. They met again seven months later, at a reception in Montenegro celebrating McCain’s birthday, as reported in The Washington Post. The visa ban was costing Deripaska billions: for years he and fellow RusAl shareholders had sought to cash in their wealth by launching an IPO in London, which could have netted up to $10 billion for RusAl’s owners. However, finding institutional buyers would be difficult if not impossible as long as RusAl’s primary owner was barred from entering the United States. Despite rampant Russophobia among Republicans, Deripaska turned to powerful GOP figures to solve his problem—especially to Republicans connected with McCain. In 2003 Deripaska hired former presidential candidate Bob Dole, who had nearly picked McCain as his running mate, and Dole’s lobbying partner Bruce Jackson (also a McCain aide) to lobby the State Department to overturn the visa ban, according to Glenn Simpson and Mary Jacoby of The Wall Street Journal. Over the next few years Dole’s firm, Alston & Bird, was paid more than $500,000 to push for Deripaska’s visa. Not surprisingly, the lobbying worked: in December 2005 Deripaska was issued a multientry US visa, according to the State Department. During his brief stay he signed his World Bank loan, spoke at a Carnegie Endowment meeting and attended a dinner for Harvard University’s Belfer Center, where, thanks to a generous donation, he became a member of its international council. However, Deripaska’s trip did not end well. Under the visa’s terms, he was forced to endure lengthy FBI questioning. According to the mining-industry newsletter Mineweb, the list of his enemies had grown from jilted former business partners to the heads of powerful US metals companies and government officials unhappy with RusAl’s control of key Third World bauxite mines, which threatened beleaguered US aluminum giants. The interview went badly—according to people who know him, Deripaska had little patience for prying bureaucrats. When he left the country, the visa ban was reinstated. Once again Deripaska turned to powerful Republicans—this time, to McCain and campaign manager Davis, who arranged the January 2006 Davos introduction. The McCain campaign later claimed that “any contact between Mr. Deripaska and the senator was social and incidental,” but afterward Deripaska thanked Davis for arranging “such an intimate setting.” The Washington Post reported that Davis was “seeking to do business with the billionaire.” Indeed, Deripaska’s subsequent thank-you letter mentioned his possible investment in a metals company Davis represented through a hedge-fund client. If you’re wondering how Deripaska came to know Davis & Co., the answer lies in Russia’s next-door neighbor Ukraine. In December 2004 Ukrainians poured into the streets of Kiev and other cities in the peaceful ”Orange Revolution,” which overthrew a Putin-backed corrupt leader, Viktor Yanukovich, who had tried to steal the country’s presidential election that year (during which the pro-Western opposition candidate, Viktor Yushchenko, was poisoned and almost died). It was a serious blow to Russia’s geopolitical standing. Putin’s Ukrainian proxies were also in trouble. Shortly after the Orange Revolution, a murder investigation was launched against the country’s richest oligarch, Rinat Akhmetov, Yanukovich’s main backer. Akhmetov fled the country. In exile in Monaco, he turned to Davis’s business partner, Paul Manafort–the second name in the lobbying firm Davis Manafort. An old GOP hand, Manafort, like Davis, had played a key role in Dole’s failed 1996 presidential run and had worked for dictators like Ferdinand Marcos of the Philippines and Mobutu Sese Seko of Zaire. Akhmetov initially hired Manafort to improve the image of his beleaguered conglomerate, SCM, but soon Manafort’s role shifted to helping Yanukovich. Manafort assembled a skilled team of political operatives in Ukraine and set about raising the popularity of Yanukovich’s pro-Russian Party of Regions, which Akhmetov financed. It was a very lucrative deal for Davis Manafort—and successful (according to Ukrainian investigative journalist Mustafa Nayem, Akhmetov paid Manafort upward of $3 million). Yanukovich’s disgraced party won a resounding victory in the March 2006 elections—and Akhmetov returned as the top Ukrainian oligarch. Thanks in part to the work of Davis Manafort, the Orange Revolution was essentially undone, putting Putin back in the chess match over Ukraine’s future. Publicly McCain and his campaign chief’s lobbying firm were on opposite sides. In 2005 McCain had nominated Orange Revolution hero Yushchenko for the Nobel Prize, and that spring he’d honored Yushchenko in the headquarters of the International Republican Institute, whose board McCain has chaired since 1993. But behind the scenes the former head of IRI’s Moscow office, Philip Griffin, was recruited by Manafort to work on Yanukovich’s campaign against Yushchenko. Davis Manafort’s work was considered so detrimental to US interests that a National Security Council official called McCain’s office to complain, according to the New York Times. The McCain campaign denies receiving the NSC complaint. But the firm’s work was only just beginning. The same month Davis Manafort helped deliver this victory to Putin’s proxies, it started work on another key Kremlin success story: an independent and Russia-dominated Montenegro. First, a little history. Montenegro was the smallest of the former Yugoslavia’s six republics. When Slobodan Milosevic was overthrown in October 2000, Montenegro’s longtime strongman, Milo Djukanovic, figured the West would reward him by supporting his push for independence. But the European Union and the United States opposed Montenegro’s secession, which they feared would undermine the new, pro-Western leaders in Serbia and bring more war. So under heavy pressure from the EU, an agreement was struck in 2002 putting off an independence referendum for at least three years. Djukanovic then looked beyond the West for support. That same year his closest ally and mentor, Milan Rocen, was dispatched to Moscow as ambassador of the Serbia-Montenegro confederation. 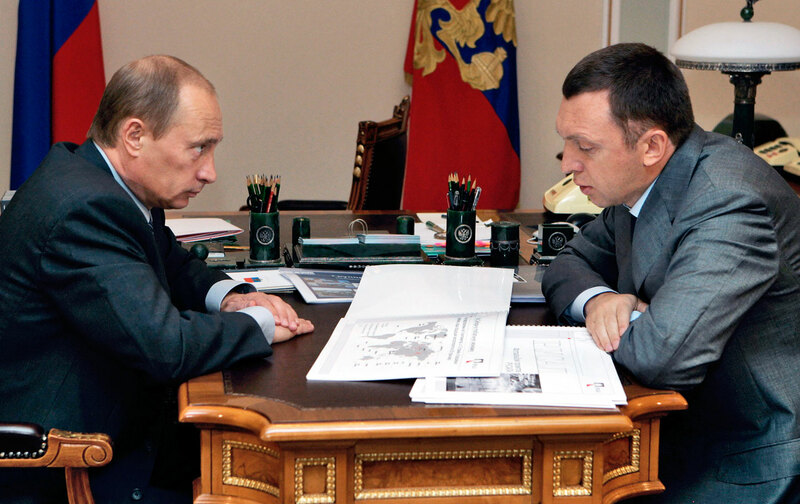 Rocen nurtured ties to Putin’s Russia, and by 2005 the biggest Montenegrin industrial asset, the KAP aluminum plant, was snatched up by Deripaska at Putin’s request. After that, Russia surprised everyone by dropping its objections to Montenegrin independence, which Russia’s historic ally Serbia vigorously opposed. “There seemed to be a belief that Deripaska and the Russians wanted to gain control of the aluminum plant as part of a Russian move for greater influence throughout Montenegro,” says former ambassador Sklar. Meanwhile, Rick Davis was also eager for a piece of Montenegro’s independence, lobbying hard for Davis Manafort to run the referendum campaign. Bob Dole, who has been paid $1.38 million by the Montenegrin government since 2001 to lobby for it in Washington, urged his Montenegrin friends to hire Davis. Whether it was because of Dole or, as some speculate, the Russians, Davis got his deal. Though Davis has claimed no connection to his partner Manafort’s controversial activities in Ukraine, he nevertheless hired at least three specialists recommended by Manafort, from the same team Manafort used for Yanukovich’s victory, to work on Montenegro’s independence referendum. They included Russian political operative Andrei Ryabchuk, an elections specialist who had previously worked on pro-Putin campaigns in Russia. Ryabchuk told The Nation that he was “recruited by Manafort’s people” out of Moscow to the Ukraine operation and then on to Montenegro. Davis’s team was vetted by Montenegro’s Russian ambassador Rocen, who was returning from Moscow to oversee the independence campaign. Why was Davis hired? The top McCain aide was as much a political symbol as a campaign consultant. “I think the Montenegrins hired Rick to have political cover–it was important to show they had support from the United States,” said an American democracy expert who’s worked in Montenegro. Though disclosure is required by Montenegrin law, Davis Manafort’s contract with the ruling Montenegrin party was never publicly released. In addition, Djukanovic’s party never listed payments to Davis Manafort on its election filings, lending credence to private claims by top Montenegrin officials that Russian business interests paid for Davis’s work through hired third parties, an oft-used though illegal tactic in Eastern Europe to disguise money trails. At key points in the campaign, Davis reached out to Deripaska’s allies for help. With the referendum too close to call, the Serbs tried to sway public opinion by threatening to revoke scholarships and other education privileges of Montenegrin students if the country should secede. This caused a panic–so to counter the Serbs, Davis turned to Deripaska emissary Nathaniel Rothschild (Rothschild has reportedly become the richest of all the Rothschilds, thanks to his privileged role as a Deripaska adviser). Three weeks before the independence referendum, Davis asked Rothschild to come to Montenegro. After arriving in his private Gulfstream jet, Rothschild was trotted out before the cameras with the Montenegrin prime minister, where he pledged $1 million to support students who might be hurt by Serbia’s scholarship threat. Another Deripaska ally brought in to secure the student vote was Canadian billionaire Peter Munk, CEO of Barrick Gold, the world’s largest gold-mining corporation (it was Munk who had hosted the Davos meeting between McCain and Deripaska a few months earlier). Munk, who serves on the advisory board of RusAl, delivered pledges of support from Canadian universities. At the same time Deripaska’s allies were employed by Davis, Dole was lobbying McCain to promote Montenegro’s independence. Dole’s aides held a teleconference with McCain’s Senate office when Montenegro’s foreign minister visited Washington; shortly thereafter, the referendum passed by a razor-thin 0.5 percent. In April 2006 McCain announced that Montenegro’s independence was the “greatest European democracy project since the end of the cold war.” Despite opposition cries of vote rigging, the United States and other major powers accepted the results—and Putin’s Russia recognized newly independent Montenegro before the EU did. Soon after the referendum, the powerful figures behind Montenegro’s independence were carving up the country. That summer Rothschild started discussions with top Montenegrin officials about gaining control of the valuable shoreline, including the half-billion-dollar Porto Montenegro project, which aims to become the world’s top mega-yacht marina, complete with luxury hotels, shopping and the country’s first eighteen-hole golf course. The property was handed to the Munk-Rothschild-fronted offshore consortium for a pittance, according to MANS, the local NGO partner of Transparency International, in yet another backroom deal. Eventually, Deripaska’s role in Porto Montenegro, which was initially secret, was formally acknowledged, although the full list of owners is still a mystery. Deripaska is also developing an 8 billion-euro resort in southern Montenegro and seeking control of a coal mine and a thermal power plant. Aside from a little campaign dough, what has McCain gotten out of all this? It’s hard to tell–either he was utterly clueless while his top advisers and political allies ran around the former Soviet domain promoting the Kremlin’s interests for cash, or he was aware of it and didn’t care. McCain was reportedly so angry about Davis Manafort’s role in stifling Ukraine’s Orange Revolution that he almost removed Davis as campaign manager. But in the case of Montenegro, he should have known what Davis & Co. were up to. After all, McCain lent a helping hand. And by the time he visited the country, the Russian takeover was plain to see. The story of how McCain’s closest aides and employees have been undermining his vociferously expressed opposition to Putin and Russia’s oligarchs offers a highly disturbing preview of what a McCain administration might look like. When McCain’s campaign proclaims “country first,” one has to wonder, Which country? The one with the highest bidder?